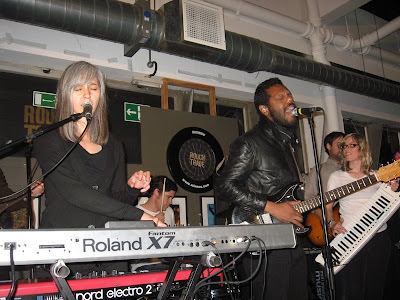 Yesterday evening I took a trip across town to see The Dears play a free gig at Rough Trade East. I confess that I am not overly familiar with The Dears so went along to this concert with an open mind. I arrived promptly an hour before the show in case there was a queue for wristbands but walked straight in no problem, maybe a sign of their slightly off the radar existence? Seeing no need to hover at Rough Trade (that's hover not hoover), I relaxed with a cup of tea (rock 'n' roll British style) in cafe 1001 just across the street to use their free wi-fi opportunity to research The Dears a little more. Here's what I now know, feel free to correct if you must! They were shortlisted for Canada’s Polaris Music Prize with their 2006 album 'Gang of Losers'. The latest album 'Missiles' is their forth album and released on North American label Dangerbird Records. 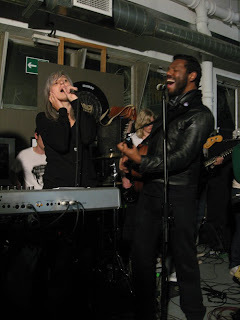 Their music has been described as a cross between The Smiths, Serge Gainsbourg and Joy Division and Natalia says “Missiles is not Indie rock”. "So there you have it, friends: our new album and finest work to date, still not due for several weeks, is out there. While we are 100% appreciative that people care enough, The Dears are still pretty old-school. This was not exactly our intention and to be honest, even though it’s kind of cool, we can’t help feeling a little bit devastated. We were always aware of the inevitability, as we are living in the modern age. In fact, we don’t expect anyone to empathize at all. Nevertheless, you now have these options: a.) download it now. b.) wait and buy it later. c.) both." So, back to the concert. 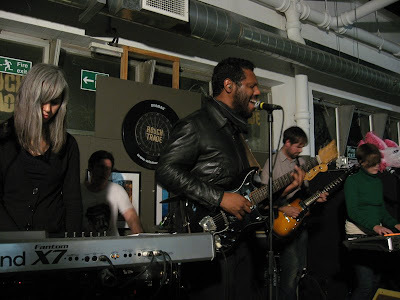 Crammed onto the impossibly small Rough Trade East stage, all seven members of The Dears took part in some sort of 'group huddle high five' before taking to their instruments and unleashing a six song set. Not a great turn out for a free gig by a band NME once described as “Probably the Best New Band in the World” but this made it easy for me to make my way to the front of the crowd and take a few photos with my extremely basic camera so I wasn't complaining. 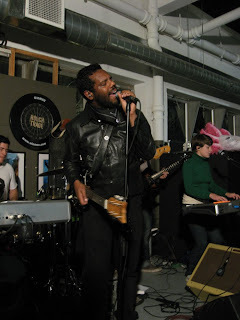 Now as I mentioned earlier, I am not very familiar with The Dears especially their new album so I was a blank canvas ready to soak it all up. 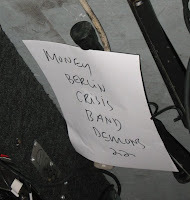 Of all the songs they performed last night, my favourite was ‘22: The Death Of All The Romance’. It had an almost Pink Floyd ‘Dark Side Of The Moon’ emotional intensity and not only that, the band looked like they were enjoying playing it. The other songs are all off their new album and while there were moments where I really felt I could 'get into' them, these moments never lasted long enough for me to be able to say yes, I really enjoyed that. Just like when you get a new album and it takes a few listens to discover whether you really like it, I got the feeling this may be the case with 'Missiles'. I'm not ready to write it off yet, I think it deserves a proper listen and am intrigued enough to await its release. "In a recent interview on XFM, Morrissey spoke of his new album, saying: 'Journalists won’t like it but real people will.' And you know I feel the same way -- not about his album but about The Dears’ album. "We have been pretty busy planning our release, that we hope at least some journalists will like. We hope everyone would like it, journalist or not, but we understand that there are many haters out there so it’s out of our control." He also has a far snazzier camera than me so has much better photos from the evening on his blog plus a video of them performing Demons.